A century ago, the nation of Sarkoris was murdered. Today, the fallen nation is a horrific, post-apocalyptic nightmare cloven by a vast canyon that connects Golarion to the demon-haunted reaches of the Abyss. This rift is known as the Worldwound, and through it the demonic hordes pour forth, set on defiling the world of mortals and claiming it for their own. Though the demons have so far been held back at the borders by barbarians and crusaders alike, the region that was once Sarkoris remains a fiendish beachhead on the mortal realm. Worse, the Worldwound itself is slowly growing—and if something isn’t done to halt this blight, the demons it spawns might one day swallow all of Golarion! Ruined cities, such as the shattered capital city of Iz, the frozen city of Dyinglight, and the river city of Undarin. An exhaustive examination of the strange and otherworldly hazards of this demon-ruled region. Key historical sites such as the Circle of the Hierophants, the Shroud of Unicorns, and Threshold, the fortress where the Abyssal portal first opened. Adventure sites ready for exploration, as well as locations like the holdout town of Gundrun, a safe harbor in a deadly land. More than a dozen new monsters, including several new demons and two new monster templates, ensuring PCs will never lack for foes in this devastated realm! The Worldwound is intended for use with the Pathfinder Roleplaying Game and Pathfinder campaign setting, but can easily be used in any fantasy game setting. 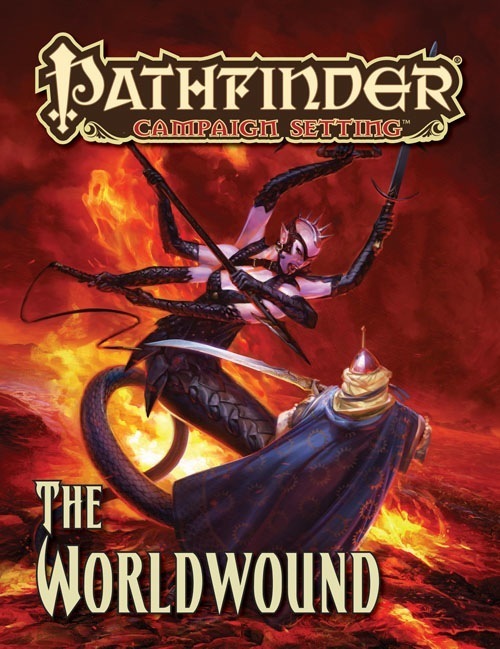 In addition, The Worldwound is the setting for the demonslaying Wrath of the Righteous Adventure Path, making this book a perfect supplement for that campaign. Written by James Jacobs, Jonathan H. Keith, Jason Nelson, Todd Stewart, and Tanith Tyrr. Cover Art by Kieran Yanner. If you're a GM and hate your players, send their characters to The Worldwound! Joking (mostly). 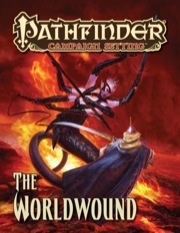 The Worldwound is a location in Pathfinder's campaign setting of Golarion, and this book is an excellent product. The premise is that a century ago, a group of demon-worshipping cultists succeeded in the one thing that most adventures assume PCs will arrive to stop in time: they opened a permanent gate to the demon plane known as the Abyss! Untold numbers of demons poured out and quickly overwhelmed the entire country of Sarkoris before a crusade of defenders assembled from all over the continent managed to partially contain the threat by erecting magical barriers around the doomed country. The fighting continues to this day as the demons probe for weaknesses and the exhausted defenders dream of some way to banish the evil forever. The former nation of Sarkoris is a blasted apocalypse overrun by demons. It's the perfect setting for mid- and high- level adventuring groups looking for maximum danger and carnage. The Worldwound book is a 64-page entry in the Campaign Setting line. The inside front cover is an excellent map of the area: it's detailed, has a scale, and is generally cool looking (really, everything one needs in a map). The inside back cover is a concise timeline of what led to the formation of the Worldwound, and the effects of the efforts to close or contain it since. The inside is divided into three chapters: a gazetteer, adventuring dangers, and a bestiary. As a minor note, I noticed and appreciated the detailed cross-referencing and incorporation of material from other Pathfinder books. The gazetteer (25 pages) covers five different regions of the Worldwound and each of them receives four pages of coverage including a half-page map of a city or other notable location within that region (unlike the main map, these maps are sparsely annotated). Unlike some campaign setting books, there are no NPC or monster stat blocks within the gazetteer. The first region to get coverage is Frostmire, one of the safest places to be in the Worldwound because there's literally almost nothing there besides ragged hills and stinking swamps: both the demons and the crusaders long ago lost interest in the place. Next up is Riftshadow, a "ruin-choked waterway" notable in part for containing the home of Areelu Vorlesh, the demon-worshipping witch responsible for opening the rift to the Abyss in the first place! The Sarkorian Steppe is the third region covered and it's notable for the raids frequently launched into the area by the barbarian tribes of the Mommoth Lords. I really liked the description of an enduring rivalry between one barbarian leader, Khraigorr Half-Face and demon named Gashgelag. The fourth region covered, Stonewilds, has a fantastic backstory involving the last stand of a powerful circle of druids whose final action stymies the demon occupiers to this day. The final region is The Wounded Lands, the actual site of the rift to the Abyss and the center of its demonic taint. The description is quite effective at making it a terrifying place to visit! Overall, the writing in this chapter is strong. My main criticism, and it's not necessarily a damning one, is that I see incredibly little incentive for PCs to want to come here. GMs will have their work cut out for themselves to persuade sensible groups that the risk is worth whatever reward is on offer. "Adventures in the Worldwound" is the title of the second chapter (15 pages). It starts with a great explanation of why travellers to the area will be lucky to survive the hazardous landscape before even thinking about the demonic armies waiting to pounce. This is the first Campaign Setting book I've seen to make good use of Pathfinders rules for weather, and each region has descriptions of its normal weather and occasional Abyss-influenced dangerous weather. In another nice touch, a detailed description is given to how Survival checks to obtain food and water are much harder in each of the different regions, and how they're likely to result in magically tainted finds that can have a variety of terrible effects. In other words, adventurers better bring their own food (and a lot of it, if they plan to stay long) and sufficient spells to protect themselves against crazy-dangerous weather patterns. Fantastically fun (and cruel) hazards like "Bowel Worms" and "Demonplague" are detailed here as well. If you want to tell a "Man vs. Environment" story, just crossing the Worldwound is a feat in itself. The remainder of the chapter gives overviews of ten different "adventure sites." Each receives about a page of coverage; for example, there's an entire village of werewolves called Moonscream Glade, and a mysterious hovering structure called simply "Hanging Tower." My favourite is Pulura's Fall, a temple to an empyreal lord that has managed to stave off the demonic forces that have besieged it for over a century. It's an evocative and inspiring tale. Do keep in mind that these entries are broad descriptions only, and a GM would have a lot of work to do (in terms of coming up with stat blocks and layouts) to actually use them in a game. They're aids to creativity, but definitely not "pull-and-play" encounters. The third and final chapter is perhaps the longest bestiary I've seen in a book in this line: 25 pages. There are random encounter tables for each of the regions, and the lowest CR on any of them is 10! A good sign, as the book explicitly says earlier, that PCs shouldn't be coming to the Worldwound until they have several levels under their belts. As for the new monsters introduced (16 of them), simply put they're as good as it gets. If you think you've seen it all, you're wrong! There's some incredibly creativity (and horror) put on display in this chapter and I would cackle with glee (or sigh with pity) to put PCs up against them. The artwork here is really strong--maybe not the absolute best Paizo has offered, but still quite effective at conveying how hideous these creatures are. Whoever was responsible for this bestiary should pat themselves on the back and be given a raise. I don't have any groups adventuring in the Worldwound at present, so I wasn't sure what to expect from reading this one. I hope, as a PC, that I never have to go there! But that's good. A fictional world needs places that scares PCs (and the players running them), and not every area needs to be suitable for 1st level characters. If your players have become jaded, the Worldwound will be an eye-opening experience. They may never forgive you! In anticipation of an upcoming campaign of the Wrath of the Righteous in which I am a player I picked this book up as a bit of an aid in immersing myself into the setting. I can only hope my GM takes us to many of the places within! I love all of these adventure hooks and points of interest. Everything from stone forests to fallen crusades, this book hints at all. In reading it, the area has a wink and a nod to this having once been the Golarion Celtic analog so that makes me a wee bit sad that its been overtaken by the demons. Its a shame there is no comparable places in Golarion that take on that setting to allow players to design characters with an eye towards a Celtic archetype. However there are meant to be Sarkorian survivors and refugees, I suppose that's something. The Worldwound is really quite an impressive book. The desolation and despair of the setting come across remarkably well, while at the same time, the little glimmers of hope that dot the region (a few hold-outs for the forces of good) keep the book from becoming too depressing in its subject matter. In many ways, travelling to the Worldwound is like travelling to the Abyss without leaving Golarion, so it presents a very, very different setting to what is just next door. Even the sky and the weather behave in different ways. It’s not an area of the world I’ve paid a lot of attention to in my gaming up to now, but after reading this book, I just may pay it a little more in the future. Announced! Product image is a mockup, and will change prior to publication. Looking forward to just how nightmarish this place can get! Not as interested with this one as most will be. Also looking forward about hearing more about the AP "Wrath of the Righteous". Screaming/weeping forests of flesh? Lightning that hates? Charred silouettes of long-dead Sarkori, trapped in the walls of their old homes and unable to move on? Body horror of the highest order? River of madness-style expeditions that have gone horribly, horribly wrong? Just turned over a bunch of monsters for this, ranging from the vicious to the grotesque. Hope people enjoy! Mr. Nelson gives good monster! I swear he's Lamashtu's nephew! On a serious note, I am excited to see this book. I'm a fan and student of the Old Sarkoris chapter of Lost Kingdoms and I look forward to the "after" side of the story, now that I have seen the "before" perspective. I recommend Lost Kingdoms incidentally. I think it gives a much clearer vision of what Sarkoris was like than the Worldwound chapter of the Inner Sea Bestiary. Now this will be an interesting book. Can't wait to see what they do with it. Should be great for those who want to Golarionize Rappan Athuk and Slumbering Tsar. And (hopefully in the not too distant future) Tomb of Abysthor. This sounds like a great product and I am really looking forward to the AP as well. Excellent - a way to learn about those I hunt, stalk, and kill! Even if I point out that there's gonna be about 17 new monsters, of which 2 are new templates? Not if the 17 monsters are demons(or devils), related to the Abyss(or Hell), or the World Wound. I will still get it since it is not so bad that I will end my subscription over it. Om nom nom templates nom nom templates!! I hope Cabal Devils get some luv...SOON. Won't be much devil love at all in this book, though... the Worldwound's all about demons. Dragon78 rather sees pixies, robots and Nixies that's the fact. Give me new demons everyday! I would love 17 new monsters, but not 7 new monsters and 10 new unique human enemies. As disheartened as I am about not making the top 32 of Superstar this year, I'm just as much excited for the Worldwound book and Wrath of the Righteous. It's a difficult juxtaposition of emotions. One of the things I really like about the bestiaries featured in recent Campaign Setting books detailing regions is the inclusion of NPC stat blocks, fluff, and artwork for allies and adversaries the PCs might come across and if that trend continues in The Worldwound, I'll be a happy gamer. A 50/50 ratio sounds good to me. Right, and the product descriptions for the books containing a good mix have all done as much (Lands of the Linnorm Kings, Isles of the Shackles, and Magnimar: City of Monuments). If The Worldwound does contain a good mix of NPCs and monsters, I'm sure the final product description will say as much. See, I'm in the "NPC statblocks have no place in what is supposed to be a Bestiary section" camp. 50/50 is way too high for my tastes. Just race/class and maybe listing a few key pieces of equipment is about all I want out of core race NPCs. 17 monsters, I hope we get that many if/when they do campaign books for the first world, Numeria, etc. Originally, I had an entry for 2 pages of cultists, but that's gonna get cut so I can pick up and convert a few necessary monsters from Green Ronin's Book of Fiends. So at this point... there's no NPCs in the bestiary for this book—it's all monsters. We won't be reprinting the babau and balor pictures from the Bestiary Box in this book. Probably a month or so away. Is there any chance that we might see those cultists as a web enhancement/blog post after the book's release? Not really. There'll be PLENTY of cultist stat blocks in the Wrath of the Righteous adventure path, and there's already plenty of cultists in the NPC Codex or GameMastery Guide. Not really. There'll be PLENTY of cultist stat blocks in the Wrath of the Righteous adventure path. Heh, yeah that was a brain fart on my part. I'd forgotten about Wrath of the Righteous and it's one of the highlights of the year for me. As much as Demon cultists would be interesting.....any chance there will be information on any of the Sarkorian cult "hold outs"??? It would be awsome to have more information on those Kellid that are trying to reclaim their old clan holdings and re-establish their lands. Did I somehow bring the discussion to a screeching halt ? Love these area/country books! Keep them coming, and I'll keep buying them. There will indeed be some information about the previous religions in the area... particularly focusing on some of the Green Faith stuff. Will we see some new feats and traits? I truly miss the Twisted Flesh and Warped Mind feats. Also, the demonic implants are a favorite of mine, will there be more? How does the favored terrain ability work with the Worldwound? Are there multiple terrain types to take, does it all count as Plane (Abyss), or what? No new feats or traits in this book. No more demonic implants in the book either... but we are planning to have more demonic implants in an article in one of the Wrath of the Righteous installments. And favored terrain works the same as anywhere else—there are hills, mountains, swamps, rivers, etc. in the Worldwound. The Player's Guide to Wrath of the Righteous will have a bit more detail. Hope Mendev gets a player's guide along with this. It's going to be hard to understand the two regions without each other. Any chance on getting a Mendev/Crusaders Players guide to compliment this?